Sukin is an Australian brand that has been on my radar for some time. Sadly pretty much the entire range of products contains tangerine so I am not able to try them. However, they have launched a Sensitive Skin range specifically targeting those of us with skin conditions such as eczema, psoriasis, rosacea and dermatitis. This range does not contain tangerine so I accepted an offer to try the Cleansing Lotion pictured above. Sukin products are Vegan and free from sulphates, synthetic fragrances, animal derivatives, harsh detergents, petro-chemicals, artificial colours, triethanolamine, mineral oils and parabens. The sensitive range consists of cleansing lotion, cleansing gel and moisturiser. These products are full of lovely ingredients like aloe vera, chamomile, rosehip, cucumber, shea butter, avocado and jojoba. You may have notice from the picture above that Sukin do use Phenoxyethanol which I know some of my readers prefer to avoid. I have been testing the cleansing lotion for a couple of weeks. I know you all like to hear I have been testing something for months but I knew straight away this cleanser was perfect for me. The consistency falls between a cleansing milk and cream. What I mean by this is it's not runny like Nourish which I tried last month but it's not as heavy as Tropic. I use it morning and evenings. It feels lovely on my skin and you can easily massage across the face. I opt to remove with a damp muslin cloth but you could use cotton pads or rinse with water as it works well in the shower. I find it removes my foundation which is evident on my cloth. The fragrance is gentle and sugary from vanilla. It just suits me perfectly. I have a little patch of eczema on my chin and I have not notice any added irritation when using this cleanser. 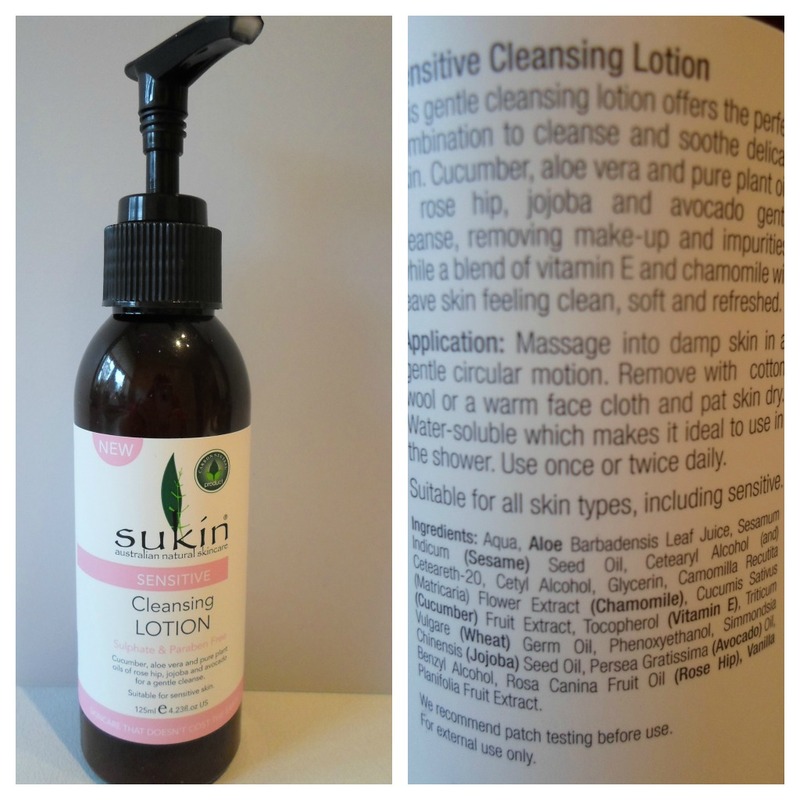 You can buy Sukin skincare in the UK from cressuk.com and the prices are very reasonable. The cleansing lotion is £8.12 for 125ml pump bottle. I'm happy to recommend the products to you as I can see myself buying this when it runs out. The existing range is quite large, many products for top to toe, you should have a look, it's sold at the same website I've mentioned above.